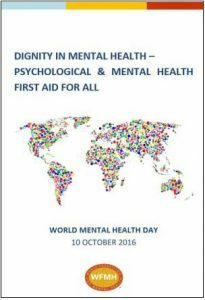 The global theme for 2016 ‘Dignity in Mental Health – Psychological & Mental Health First Aid for All’ will enable the WFMH to contribute to the goal of taking mental health out of the shadows so that people in general feel more confident in tackling the stigma, isolation and discrimination that continues to plague people with mental health conditions, their families and carers. One in four British adults will experience a clinical mental health problem in any one year. However, there is still a (totally false) belief that mental health is somehow less serious or important than physical health, which makes sufferers more unlikely to ask for help. Many sufferers will receive little or no help when they present in an emergency. In contrast the majority of people with physical health difficulties who present in an emergency in a public or hospital setting will be offered physical health first aid. The WFMH states that psychological and mental health first aid should available to all, and not just a few. The North Tyneside theme for this year is ‘Where To Turn?’. This theme was derived from the WFMH’s theme and it will allow the NT WMHD Planning Group to focus on more than just crisis care. It is hoped that celebrations will be informative as new and existing organisations will be invited so the community is aware of the latest services and contacts. The main event will be held at The Crescent Club, Cullercoats from 11.00 am to 5.00 pm on Friday 14 October 2016. As part of the celebrations, about 8 agencies will be giving a 5 minute presentation by the organisation’s representative focussing on how their service operates and supports people, followed by a 5 minute testimony from one of their service users – telling the story of their ‘journey’ and how the organisation helped them, followed by 5 minutes of questions from the floor.